Peter (aka Professor) West has always loved music. To give you an idea, his mother recalls when Peter was a small child in the 1980s. She tells about how Peter would rather her take him to a music store to hear/buy cassette tapes than to a toy store for the typical toys kids his age would be interested in. By age 7 he was begging his parents invest in a musical instrument for him. They were fortunate enough to be able to buy a piano for him, which was the instrument of his preference. In Junior High he joined the band and learned to play clarinet. He continued with this when he was in high school for both the concert band and marching band. When his Junior year in high school came around, the band teacher talked to Peter about they had plenty of skilled clarinet players in the band, but the brass sections were very thin, and asked Peter if he would be willing to learn french horn to help with the concert band, and mellophone to help with the marching band. He did. He went on to perform the concert band at his college, California Lutheran University, touring Europe in 2001. The next year, 2002, Peter’s life as a musician changed to a completely different direction. A close friend invited him to a large-scale warehouse party in Los Angeles, and that night Peter found himself mesmerized by what the DJ was doing, and spent the whole night curiously watching. Peter had long been a fan of electronic dance music, but he had never been to a party like this before and it was his first exposure to a live DJ mixing vinyl records. Hearing the music blended and used in this creative way led Peter to immediately want to try his hand at DJing. Peter immediately sought out stores in Los Angeles which held expansive selections of vinyl and started buying used EDM records of various genres, while at the same time saving up for a pair of turntables and a mixer. After he purchased a beginner’s set of Numark equipment, he spent the next 2 months holed up in his dorm room annoying his roommates while grinding down the grooves on the few records he owned in order to teach himself the basic principles of DJing. He would go to more parties in LA on the weekends to sit and watch professional DJs do their work. In several years, he was confident enough to hand out a short demo he recorded, and started getting booked at underground parties in Santa Barbara. His presence was soon felt by many and he began getting booked at small night clubs. By 2007 he was getting booked to play the same type of large-scale parties in LA that he first witnessed live DJing at back in 2002. He enjoyed playing these larger parties in LA for several years before deciding in 2012 that he wanted to step away from the wild LA parties and perform more locally in Santa Barbara. Professor Pete has been focusing on wedding receptions, corporate events and school events over the last few years. When you book Pete West to play your event, he will bring any genre of music you ask of him, and mix it with style and grace. 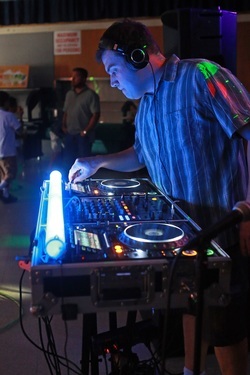 You can be sure he will bring just the perfect vibe to your event!